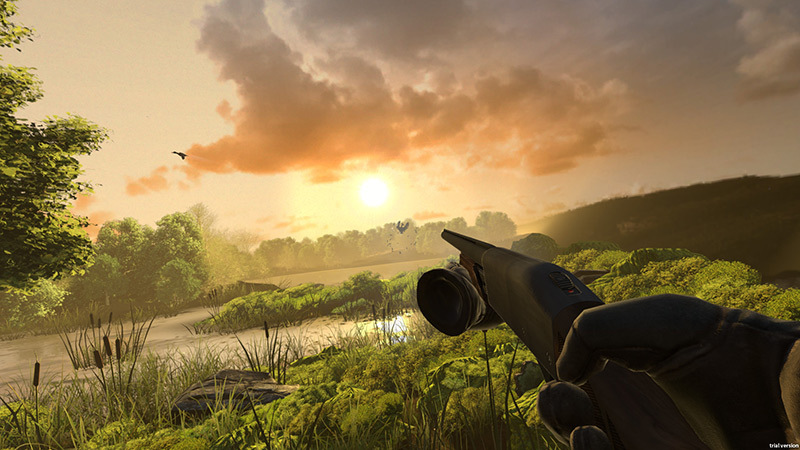 Duck Season is a unique first-person adventure game from the developer of Hover Junkers. It's a throwback to the 1980's gaming and movies. Aside from the duck hunting experience, the game features seven mini games to play on your Kingbit Entertainment System, lots of Easter Eggs and hidden secrets and seven unique endings to the story. An action-adventure VR game with some unique twists that will keep you entertained more than your casual hunting shooter game. Duck Season is a room-scale action-adventure game that part of it is about shooting flying ducks using your pump shotgun, but it offers more than just that. The game takes place in the Summer of 1988. You play as a kid whose mom has just rented that cool Kingbit Entertainment System for her child. The way that you play the game, will reflect upon its ending, and there are seven different endings to the story in this game. The game also offers the player to play seven different mini games, as part of the Kingbit Entertainment System by inserting game cartridges into the gaming console. 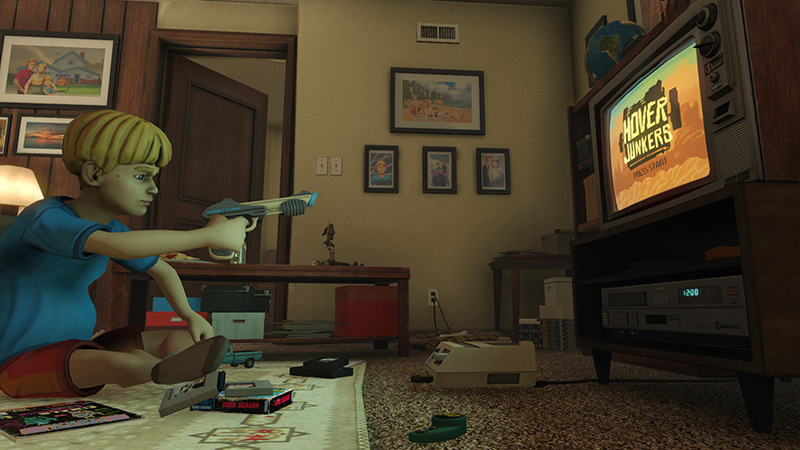 Some mini-games can be played off-screen in the virtual reality world, where you use the gun controller and pay them in front of the virtual TV set. There are also various items lying around in the living room which you can interact with. For example, there are various VHS tapes which you can play on the video to watch some short films. For me, it was really nostalgic to see all that nostalgic 80's setting, with that old TV set, the old gaming console and those videos that are a direct throwback to the golden age of the 1980's. Just watching the trailer and the gameplay session at E3 2017 brought up some really beautiful memories. It helped bring some really enjoyable and happy childhood memories that some of them I've already forgotten. Maybe I just need that type of game to bring those memories back again. I'm pretty sure that this game will be relished by old folks like myself who have lived at that time period, but I also believe that it will be also fun for people who were born after this time period. It's like a time travel experience, where you get to play and feel as a child in a place and time that you haven't had a chance to experience. Duck Season is developed by Stress Level Zero, the same developer who brought us the amazing Hover Junkers VR multiplayer shooter. To be honest, I was quite surprised to see a game that is so different than their first game. On the other hand, I think it's great to see a gaming studio trying out various gameplay ideas instead of sticking with a single genre. You know, it's really interesting. 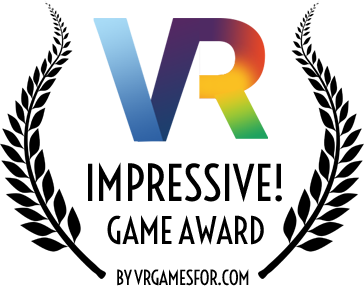 I've read that the top choice for interactive VR video/TV/Movie content is action/adventure (60%) based on Touchstone Research. I've also read that the age groups that are most excited to experience virtual reality are Generation Z (1995–2009, 79%) and Millennials (the 1980s as starting birth years and the mid-1990s to early 2000s as ending birth year, 73%). I don't know the Vive and Rift age group distribution, but I have feeling that it's more towards the Millennials due to the high entry-price of those headsets and the requires hardware requirements. So I assume that a big chunk of them are adults who have lived at the time period that this game takes place at or born not so long after. I am one of those people myself, and I am thrilled seeing such an original title that can take me back in time to relieve some of my childhood memories. There was certainly a conscious decision behind making this type of game. As an adult who lived at that time period and an enthusiast VR gamer, I know that I really want to put my hands on this title the moment it is released. The humor in this game also reminds me some VR games like "Accounting" and "The American Dream". We've already seen many crazy and funny games that made them very popular mainly because of their great fun and humoristic gameplay experience that many VR gamers seem to like. Judging by the gameplay trailer and the gameplay session that I've seen, the graphics look really nice. It was also really cool to be able to see the kid's hands in VR for a change, rather seeing the motion controllers as your hand like in many other VR titles. It makes you feel more like that kid when you are inside the game. This is one of the cool things about VR, being able to do some really cool stuff and be in a different place in time—things that you (probably) won't be able to do or won't be doing in real life. All in all, I am really excited to jump into the world of Duck Season and become that child in that 1988's virtual world. I'm sure it's going to be a fun, nostalgic and exhilarating VR gameplay experience. Duck Season is coming out on September 14, 2017, for both HTC Vive and Oculus Rift VR headset.